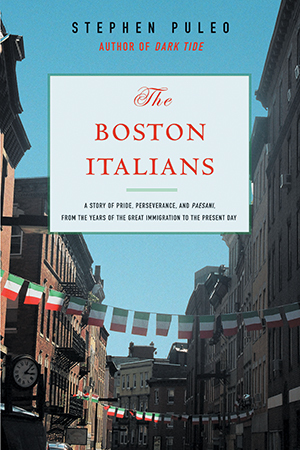 In this lively and engaging history, Stephen Puleo tells the story of the Boston Italians from their earliest years, when a largely illiterate and impoverished people in a strange land recreated the bonds of village and region in the cramped quarters of the North End: Sicilians lived next to Sicilians, Avellinesi among Avellinesi, and so on. Focusing on this first and crucial Italian enclave in Boston, Puleo describes the experience of Boston’s Italian immigrants as they battled poverty, illiteracy, and prejudice (Italians were lynched more often than members of any other ethnic group except African Americans); explains their transformation into Italian Americans during the Depression and World War II; and chronicles their rich history in Boston up to the present day. He tells much of the story from the perspective of the Italian leaders who guided and fought for their people’s progress, reacquainting readers with pivotal historical figures like James V. Donnaruma, founder of the key North End newspaper La Gazetta (now the English-language Post Gazette) , and politician George A. Scigliano. The book’s final section is devoted to interviews with today’s influential Boston Italian Americans, including Thomas M. Menino, the city’s first Italian American mayor. The story of the Boston Italians is among America’s most important, vibrant, and colorful sagas, and necessary reading for anyone seeking to understand the heritage of this ethnic group.